The Mistletoe Pages – Mistletoe information from the UK, aiming to provide helpful information on many aspects of mistletoes – their biology, conservation, control, traditions, harvesting, medicinal usage and traditions in art nouveau. Most of the site is about the classic mistletoe of northern Europe – a rather mysterious plant parasite, with a complex folklore, and, perhaps, serious potential in medicine. 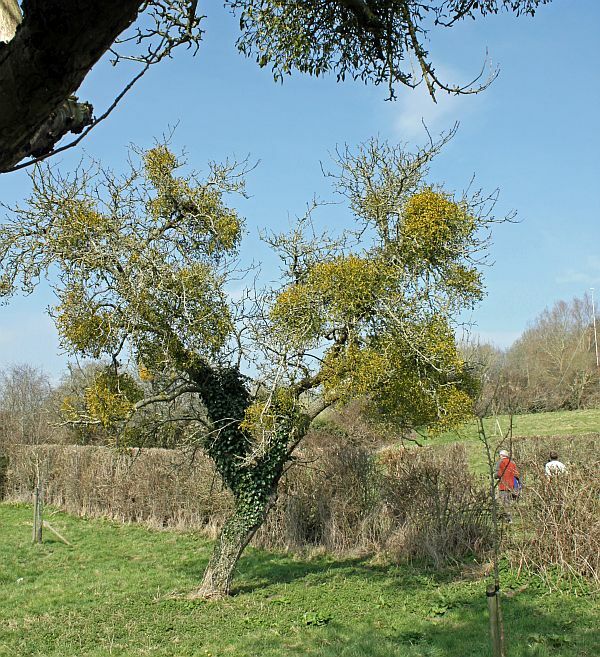 Welcome to the Mistletoe Pages, a website packed with information about mistletoe; its biology, traditions, cultivation and conservation. The site is mainly about the ‘original’ mistletoe of northern Europe, and concentrates mostly on its status, management, conservation and traditions in the UK. 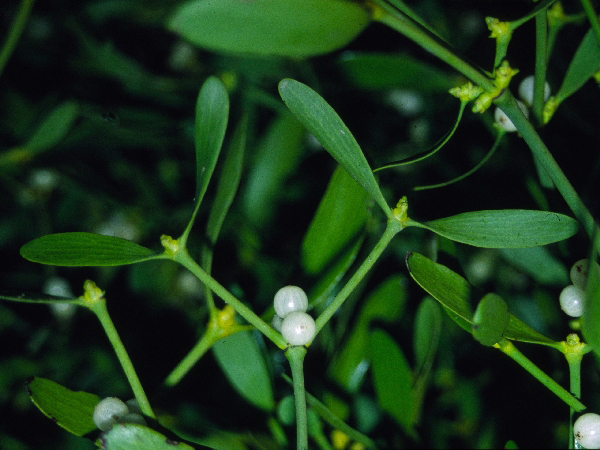 This species is technically known as European White-berried Mistletoe, Viscum album. Most people just call it Mistletoe of course. All mistletoes are, of course, parasitic on trees. Apple trees are one of Viscum album’s favourite hosts; this one is almost covered in evergreen mistletoe bunches. There are many other mistletoes around the world, including some others used in Christmas and midwinter celebrations, but Europe’s Viscum album is the original and, arguably, the best mistletoe. Most popular traditions were originally based on this species, so it’s particularly important in folklore. And it is the only mistletoe that has the distinctive forked branches, paired symmetrical evergreen leaves and pearlescent white berries associated with midwinter and Christmas. But other mistletoe species feature in the website too, so do have a look around even if you don’t have the original mistletoe growing in your neighbourhood!